Performers include: Matthew Macfadyen, Jerome Flynn, Adam Rothenberg, MyAnna Buring, Charlene McKenna, Amanda Hale, Jonathan Barnwell, David Wilmot, and David Dawson. This dramatic TV show begins in April 1889 in London — six months after the last Jack the Ripper killing. H Division is responsible for policing one and a quarter square miles of East London, a district with a population of 67,000 poor and dispossessed and also filled with factories, rookeries, chop shops, brothels and pubs. The men of H Division had hunted Jack the Ripper and failed to find him. When more women are murdered on the streets of Whitechapel, the police begin to wonder if the killer has returned. To investigate the killings, calm and meticulous Detective Inspector Edmund Reid (Matthew Macfadyen) and his troubled right-hand-man, Detective Sergeant Bennett Drake (Jerome Flynn), team up with Captain Homer Jackson (Adam Rothenberg), a US Army surgeon and a former Pinkerton detective who’s an expert in the world of early forensics. They cross paths with Tenter Street brothel madam Long Susan (MyAnna Buring). She and Jackson came to London from America and both reside at the brothel. Their relationship has become strained due to Jackson’s attraction to one of Long’s most profitable girls, Rose Erskine (Charlene McKenna). Rose longs to break free from her role in Whitechapel and travel the world. Despite her husband’s reservations, Reid’s once-happy wife — Emily Reid (Amanda Hale) — is determined to make a new life by helping the fallen women of Whitechapel though she’s still troubled by a terrible family tragedy. Meanwhile, sensationalist newspaperman Fred Best (David Dawson) knows a dark secret about the Reids’ sorrow. Reid tries to bring Augustus Dove to justice and make his peace in Whitechapel. What do you think? 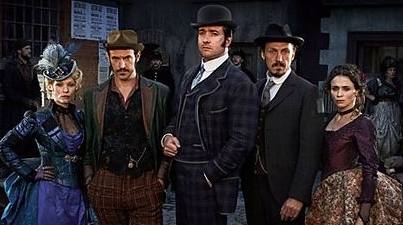 Do you like the Ripper Street TV series? Do you think it should have been cancelled or renewed for a sixth season? We loved the show, couldn’t wait for the next episode. Sorry it ended! It was a very well acted with great plots. I loved it. I enjoyed watching this show on Netflix and disappointed it didn’t continue. Would love to see it back again in 2018! Renewed. When was it canceled? Loved this show. It’s the best of it’s type. Cast is perfect. Good realistic show, like the early forensics as I am doc. All the other actors were realistic and would be a shame to lose such good actors from TV. Please renew. Mimi and Reid would have made a good pair. Great show. Worth watching compared to most. I really like this show. please bring back. Never missed an episode. Different from all of the other crime shows. Love this show! The best on TV! Something to watch that is not part of the mindless unscripted (and scripted BS) that fills up most of the stations! Wonderful Show. I am binge-watching every episode. Do not cancel!